Princeton, N.J., March 14, 2018– The Institute for Advanced Study hosted a groundbreaking ceremony today for Rubenstein Commons, a new $20 million campus building that will provide a necessary space for enhanced communication and collaboration among Faculty and scholars at one of the world’s leading centers for curiosity-driven basic research. Rubenstein Commons, which is designed by Steven Holl Architects, is made possible by a gift from Institute Trustee David M. Rubenstein, renowned philanthropist and Co-Founder and Co-Executive Chairman of The Carlyle Group. 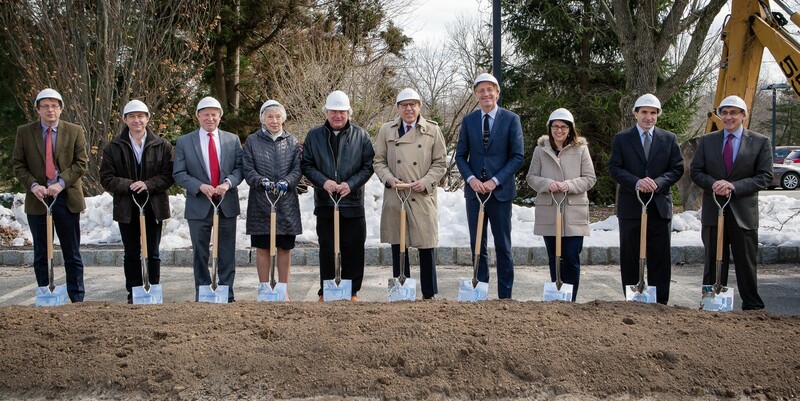 The groundbreaking ceremony was attended by David M. Rubenstein, architect Steven Holl, Princeton Mayor Liz Lempert, as well as Institute Trustees, Faculty, scholars, and staff. “On this special day, we celebrate the Institute’s rich academic history and its inspiring future, and move one step closer to the realization of this important piece of architecture. We hope the new generation of scholars will enjoy the Rubenstein Commons as it brings the community together with inviting spaces,” said Steven Holl. The Commons is conceived as a welcoming and flexible environment for interaction among the permanent Faculty and visiting scholars, and will greatly enhance the Institute’s role as a convener of academic thought and activities across the sciences, humanities, and social sciences. The building will be located to the east of Fuld Hall to provide convenient access for resident scholars and short-term visitors, and will feature a conference space, meeting rooms, and a lounge with a cafe. The Commons will also house office space and will be a venue for displaying images and materials that illustrate the Institute’s remarkable history, its extraordinary significance and influence throughout the world, and its exceptional scholarly community through exhibits, images, and archival materials. The Institute and Steven Holl Architects also celebrated the 139th anniversary of Albert Einstein’s birth. The father of modern physics worked at IAS from 1933 until his death in 1955. Steven Holl Architects currently has seven projects under construction, including the Institute for Contemporary Art at VCU, which will open on April 21, and the Glassell School of Art, which will open on May 20. The Rubenstein Commons is Steven Holl Architects’ second building in Princeton, NJ, with the Lewis Arts Complex at Princeton University completed in October 2017. To learn more about the Rubenstein Commons project click here.